This past week was murder! 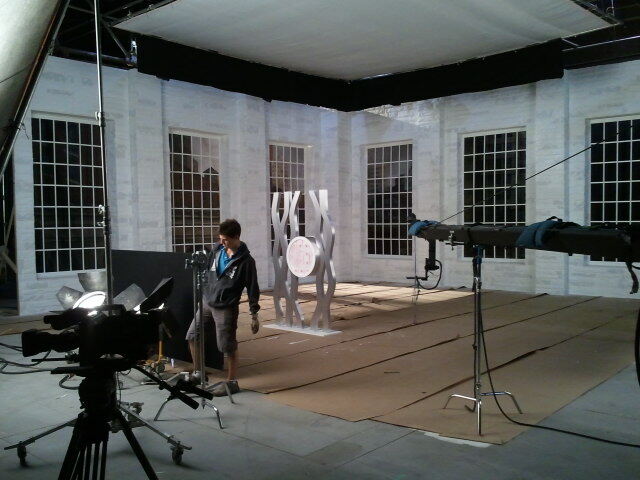 We had a small basement set to build that we constructed in studio last Thursday. Thanks D Kubista! Then I had a wedding to go to last Friday out in Ottawa, which is about 4 hours from here. Congatulations go to Mike Brown and Laura Berry(now Brown of course) This would normally be a great thing, if our Kingstar job wasn't looming over our heads. I got back from that trip at around noon on Saturday and we got into it pretty hard. This job had a number of different components to it. 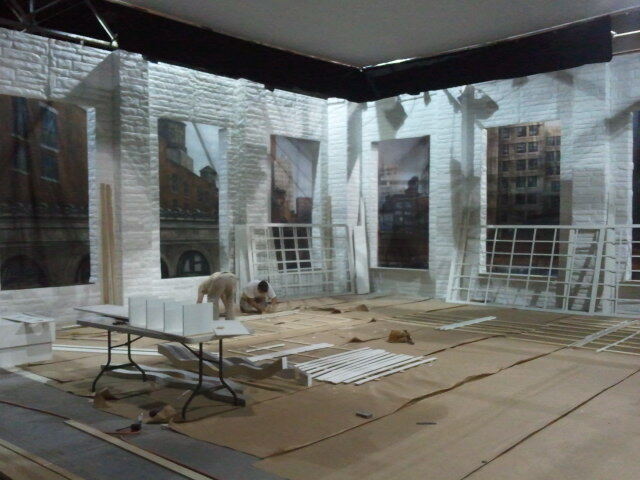 One part was a pretty big set build. 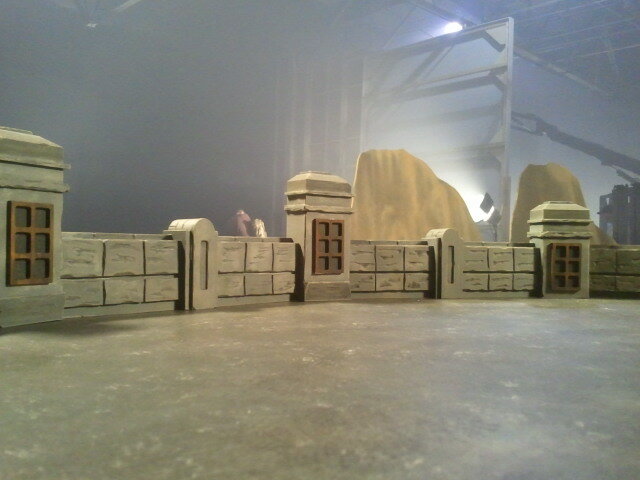 It was essentially supposed to be a large 'warehouse loft' set. All painted white with 6 windows. Sound easy enough. 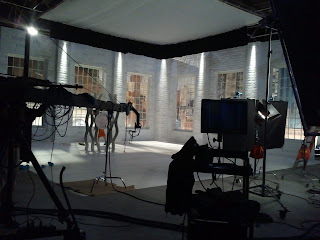 This set had 2 walls 30 feet long and 16 feet high placed in an 'L' configuration. The six windows were 5'X10'. I say windows, but they were actually just mullions set into a frame. No glass was used as we didn't want any reflections in the glass that would show the crew or cameras. 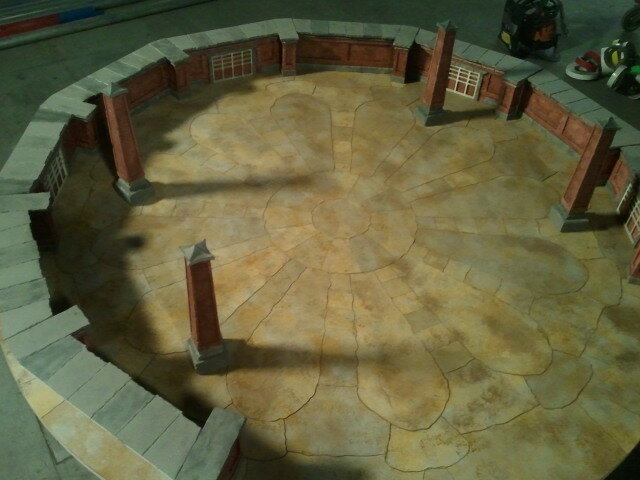 The other part of the build was a few set pieces. 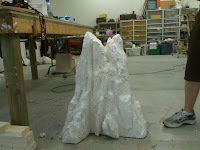 One was a 3'X4' light box that would be lit from the base illuminating the product. 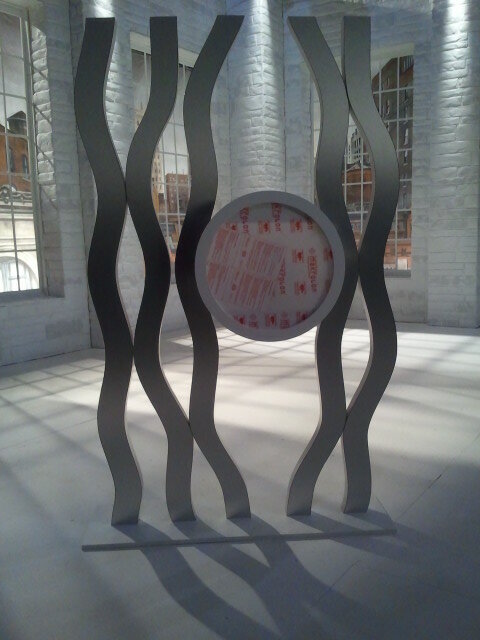 The other was a strange stylized floor sculpture that displayed the product in a central tube with LED lighting. Another was a 10' foot octagon stage that would have a queen size mattress display on top. 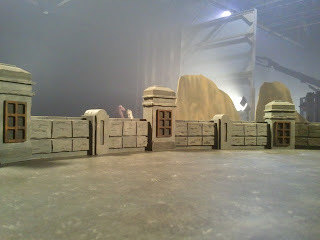 And lastly was an 8'X8' wall arch that would serve as an architectural piece on set. I'm not gonna lie, this was a huge build for the time allotted. Joe was able to come in and help out with some of the build, but as he hurt his shoulder earlier, was fairly limited to what he could do. But appreciated none the less! We worked from 9am Sunday to 2 am Monday getting the work done on the set pieces. There was a lot of 2D routing with Aspire at the helm of our Techno cnc! They seemed to be the only ones not exhausted at the end of the day. Then we all headed home and got a good nights sleep. 5 am Monday came like a freight train! We loaded up the vehicles and headed to the studio. A mere 2 hrs later we were at the studio and unloaded. 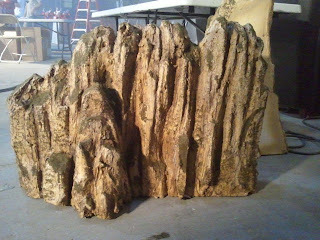 I headed out to grab the set lumber locally while the guys got started assembling the set pieces we built at the shop. 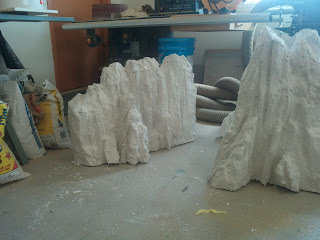 All of our vac-formed stone panels arrived on time to the studio, so that took a load of my mind. We split into 2 teams, Mike and I took to building the 5, 2'X16' columns that would join the 6, 8'X18' foot window walls that Andrew and Joe were building. Due to space limitations in the studio, and that other filming for product shots was going on, it put us a little behind the 8 ball. 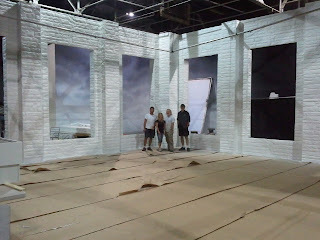 We needed to get the walls built, stoned, and painted white before we could leave. This was finished at 3:30 am, and we all headed home. I was a super stellar boss and told the guys not to come in until 10 am. That came fast as well! We continued to build the rest of the set pieces, and mill the window trim, until 6:30 pm, at which point we loaded up for the 1.5hr drive to the city. The studio was like starting whole new day. Jody got the thank-less job of painting all the pieces white, while Andrew, Mike and I started assembling the stage pieces and all the window mullions. Hanging the windows was a huge job. We couldn't use the studio lift as the windows went in from the back of the set walls, and all the backdrop lights were connected and placed. So we had to snake a 12' step ladder around all the stuff. Every window was like threading a needle wearing baseball gloves. But we did it, on time and on budget! The vans were loaded and we hit the road at 11 am Wednesday. Jody and I were so exhausted, we slept in the van in a parking lot halfway back to the shop for an hour. After we got home I felt a little more awake........................but just until 4 pm. Thats when I hit the sack and slept till 7 am Thursday. No matter how long the hours, the job eventually wraps. I have to give a super special thanks to Andrew and Mike, who went the extra mile on this short deadline job. They hung on to the bitter end, and Jody and I are very grateful to have guys like these to work beside. The strange sculpture above. Laminated mdf with brushed aluminum finish. 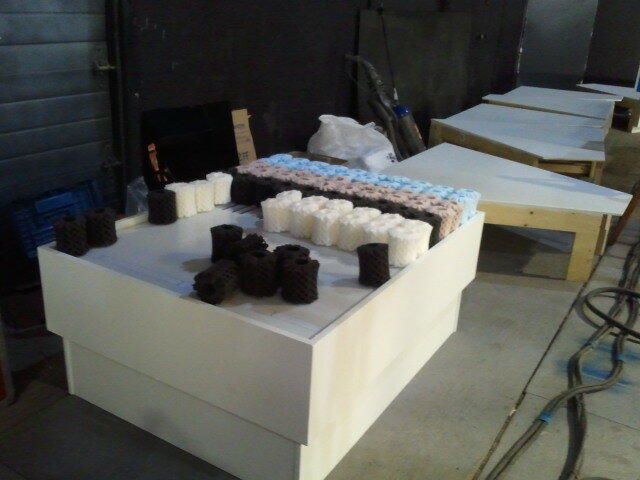 The light table box getting ready for it's on screen debut. Set day 1. The chaos ensues! Set day 2. Only forever left to go. And counting! 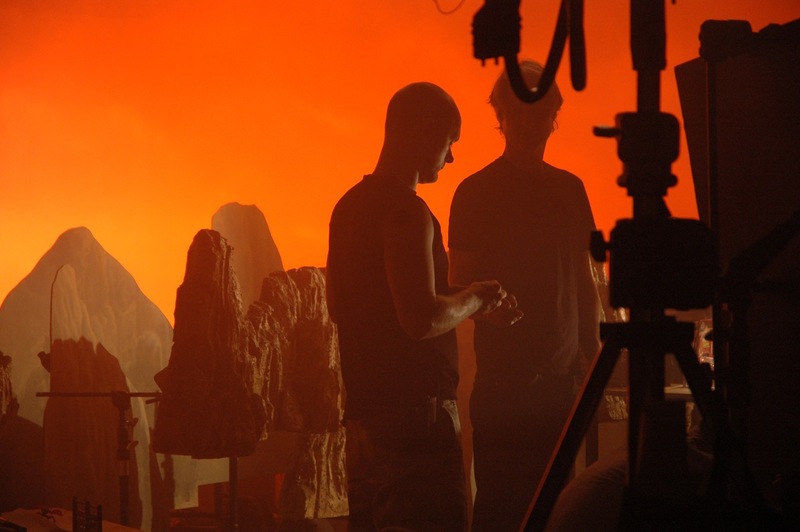 Final set with backdrop lit. 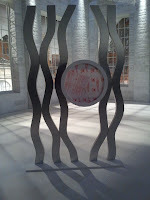 Here are some of the photos taken on set. There was a fair amount of commotion, as the lighting and rigging got set up, so I wasn't able to get as many pics as I was hoping. But I got some none the less. I wasn't able to get to see the art director Michael Borthwick on the day, as he was on another shoot, but he came the next day and was happy with his designs brought to life. Michael has a great eye for detail, and I think that it came through in the models we built. This was another great job with great people at all ends of it. We certainly are lucky! Well it feels like it any way. It's 9:30 pm and we're still in the middle of it all. I've been drawing and toolpathing as fast as I can. Jody has been dedicated to painting the final finish on a lot of the pieces. Mike and Joe are also in working steadfastly! I find that things usually flow pretty smoothly in the final hours, although this is a hindsight evaluation! 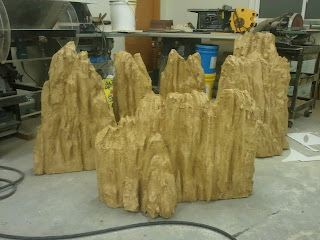 Joe got all 16 background mountains cut out of 1/4" MDF. We stapled a 1X4 to all the backs of them so they could be placed in grip stands on the day, allowing for final height adjustments. Right now our parking lot is littered with 1/4" thick mountain ranges. We applied 3 layers of different glazes to that flats and are waiting on them to dry. You know, outside, in the dark. Good thing the glaze dries quickly. One of the most difficult jobs as 'The Boss' is making sure you've got stuff to do for everyone when they finish their current tasks. Not that there isn't TONS left to do, just that you've taken the time to work on your stuff and think about what each person can do next, based on their current skill set. I hope we aren't up ALL night tonight, as the studio is 2 hours away and our call time is 7 am, which means we have to get to the shop at 4:30, load up and leave by 5am. Thankfully I love what I do, because I don't think I could work this hard at a job that stinks! Todays meeting with director Michael Patterson went very well. I have worked with Michael before on other commercials. He is in every way a great director! I think of him as the 'Michael Bay' of the toy commercials.I think he's planning on doing some Matrix style shots with the toys flying projectiles. I would love to see what he could do with $10 million and more time than 60 seconds. The meeting did take up most of the day though. We set up the pieces we had built yesterday and Michael went about lensing it all with his camera. 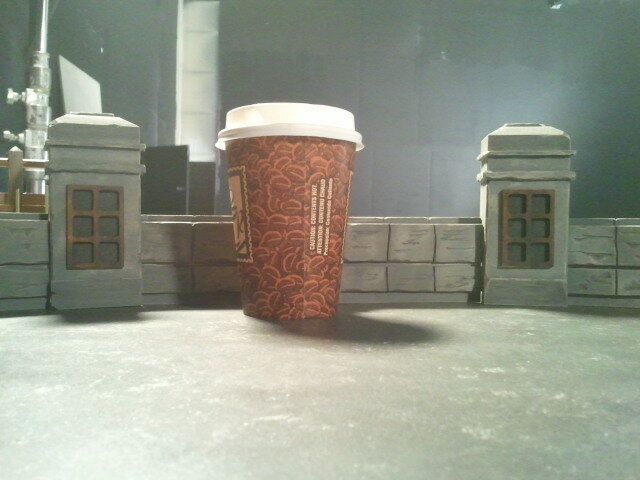 This will be shot with an extreme wide angle lens, thus collapsing the background down. 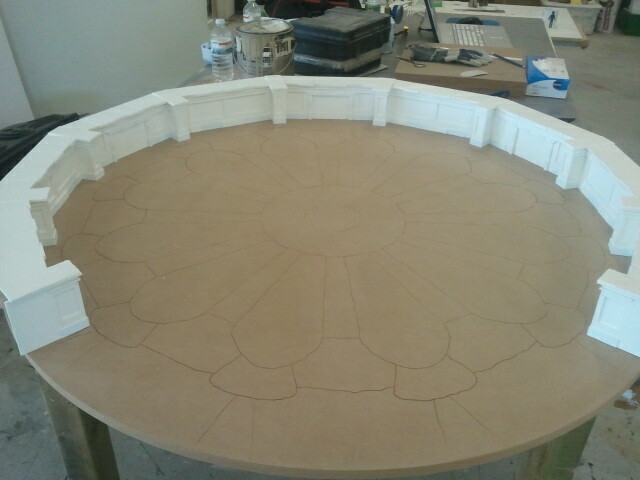 Our 4 foot diameter model arena starts to look like a baseball arena with the lens. The meeting kept rolling along while I would make small pieces here and there if he didn't need me. 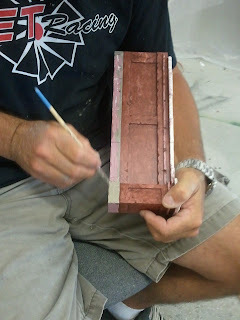 We went over the color and texture samples that we had done up, and Jody did a couple more for him. By the end of the day we didn't have a lot of stuff made, but everyone felt a little more confident moving forward. The next couple of days will be scary busy as this Titanic build gets closer to it's deadline. 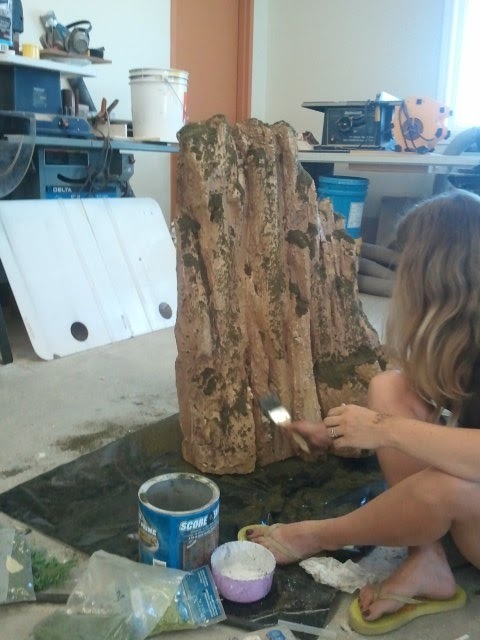 After the meeting, we were able to get the base coat on the mountains so they would be ready for a couple of coats of glaze and dry-brushing. Oh the morning is gonna come fast, I just know it! We finally got the start of our computer files from our art director Mike Borthwick last night at 10.30! I know he was crunched for time in order to get them to us as soon as possible. I got to work right away converting his files into files suitable to use in Aspire. 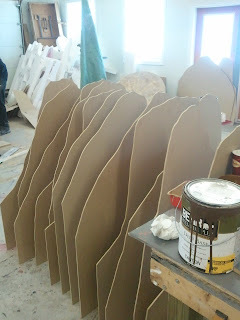 The bulk of these files will be machined as 2D flats that we will mitre the corners, and glue up in layers. 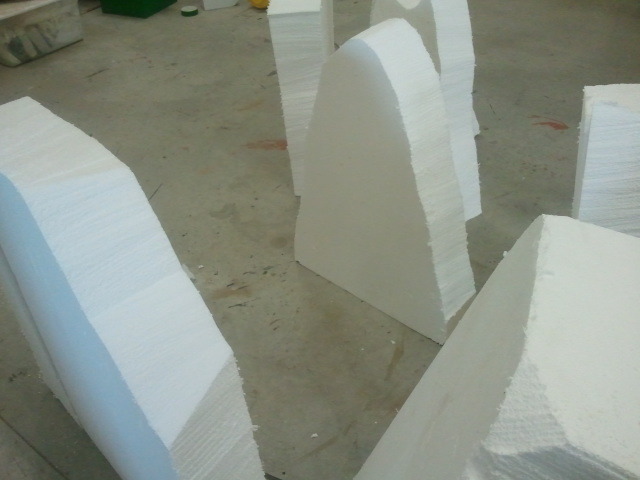 The set structure pieces will mainly cut from 1/8" pvc sintra. I chose this because of the build timeline of 3 1/2 days. Sintra machines with no burring like styrene plastic does, and it glues and paints like no tomorrow. Mike drew all the parts at the scale we were building at, as to speed up our side of things, so we wouldn't have to do any scale conversions. That Mike, he's alright! 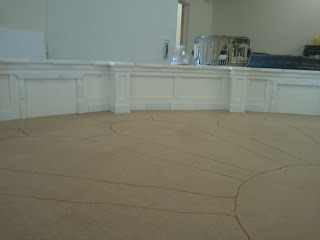 When I got to the shop this morning, I started on machining the "stone" tile layout that would be cut from 5/8" MDF. I used a small 60 deg. v-bit to cut the grooves between the stones. I added a slight texture base in Aspire, and projected the toolpath onto the surface of that texture. The theory being that as the v-bit moved up and down with the texture, it would make the groove thicker and thinner, more like real stone. 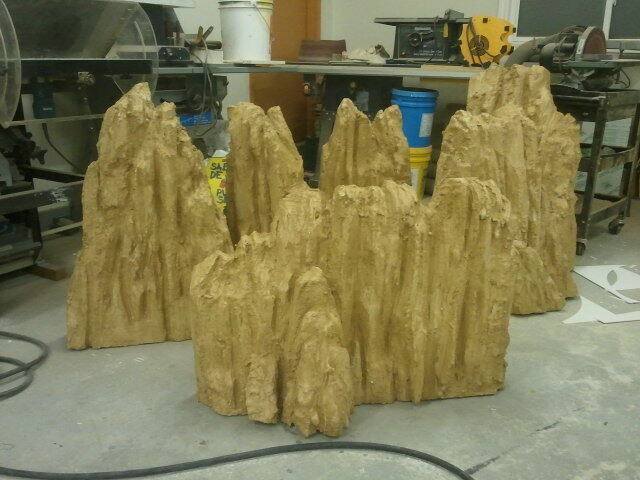 As the base was being routed on the Techno cnc, I moved on to carving the 6 mountain peaks. As this commercial will have 3 ASIAN inspired environments, we used the Huangshan mountains in China as our reference pics for color and shape. It took a couple of hours to rough carve all the peaks out of styrofoam. We decided to use type2 styrofoam, as this would make carving them with a knife a little easier on the wrists! After the mountains were all carved, I moved on to fabricating the miniature stone wall that would wrap 270 degrees around our 4 foot diameter stone bases. 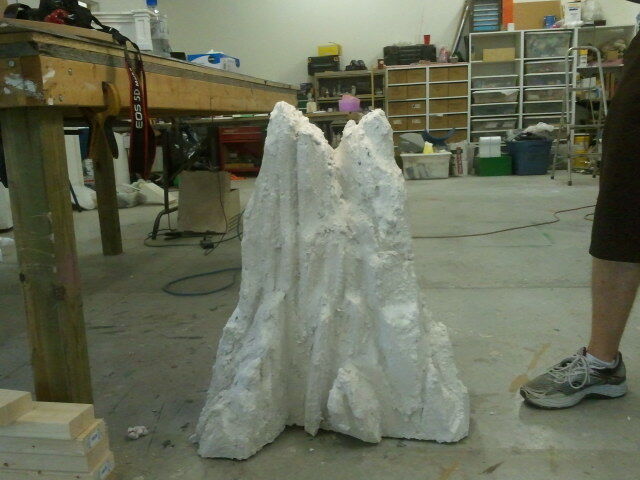 Jody moved on to hard coating the mountains with plaster. It was a good day work wise, which is good because the director Michael Patterson is arriving from L.A. and will be coming to the shop tomorrow to do some lens tests with the miniatures. 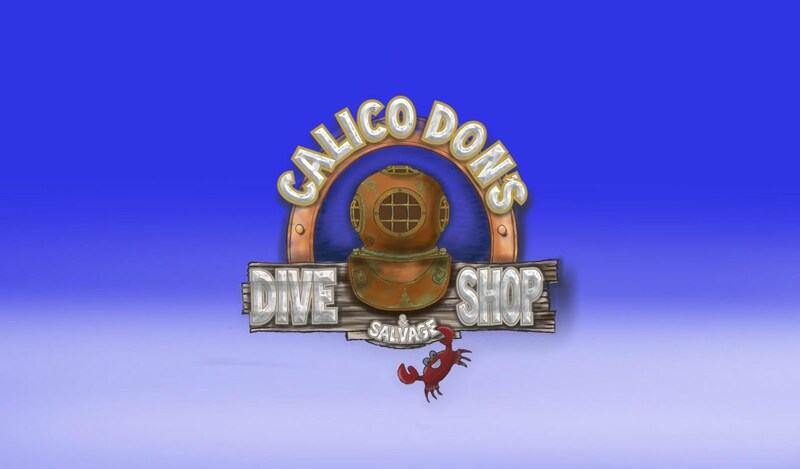 I decided late last night that the dive sign would be better if the dive helmet wasn't a 'relief' as Aspire would have it. So I re-worked the helmet model to allow me to still have it 'squashed' on the Z, but it WILL have the undercuts making the helmet visually 'jump' out of the sign. Quite a bit more work, but the final product will be 10 times better than the increased work. I will also machine the caged glass parts as 4 separate models and apply them, instead of machining the whole thing as one lump. 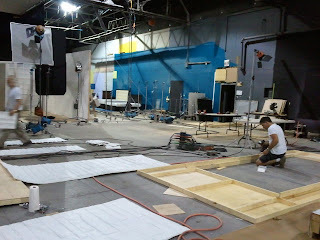 Tomorrow we start on the toy commercial sets, This will be fun for sure. The deadline is on the 13th, so we will be working fairly long hours, but there should be lots of neat things to post! 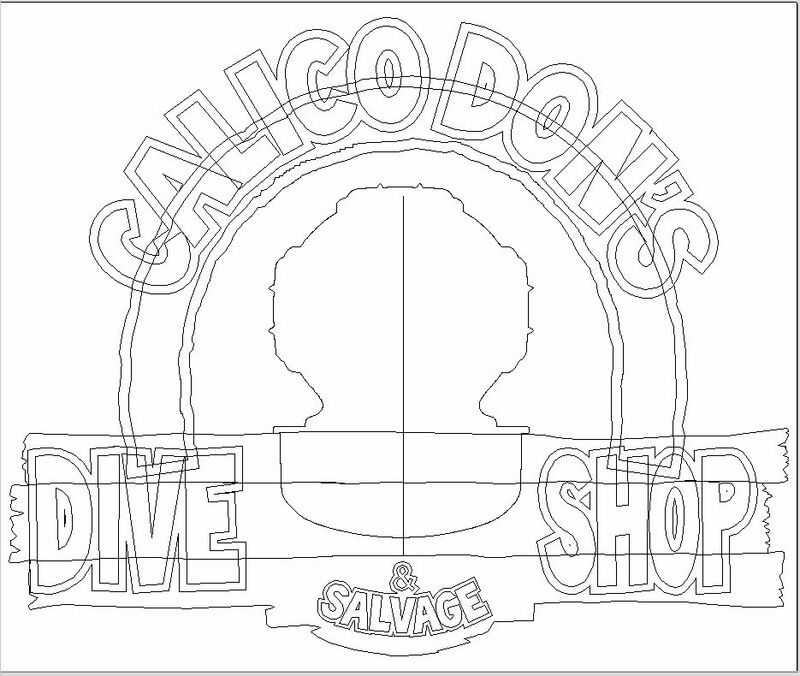 I got started fairly early this morning modeling and vectoring the dive sign project. This was a lot of fun, I really like the computer end of things. 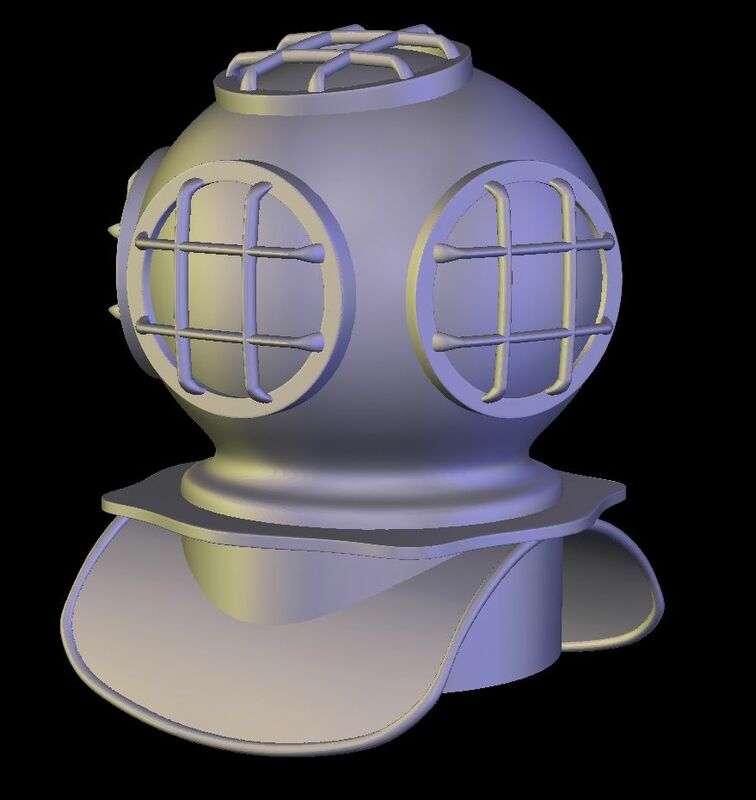 After I had all the vectors drawn, I used the helmet vector to set the size for the 3d model I would build in our Sub-D modelling program. This is the computer model when I finished it. 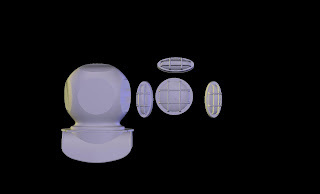 I always model in full 3D, then Squish it down on the axis that I need. 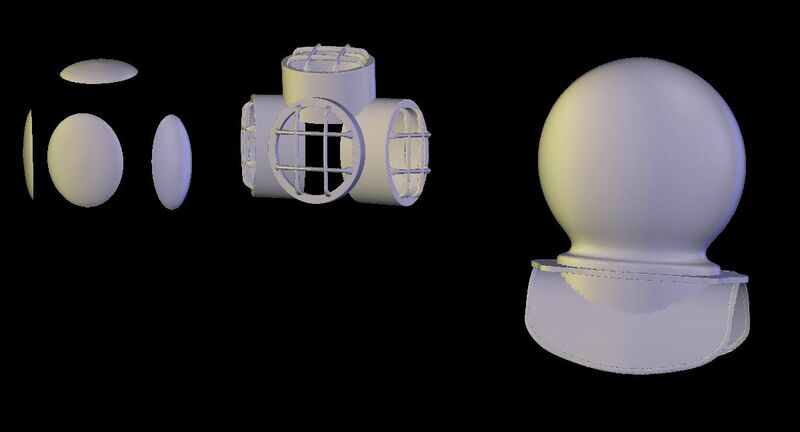 If I wanted it on a 3/4 angle, I would rotate the model, then squish it. Here's the same model now that it's been squashed on the Z. The next step was to separate all the pieces out. The reason for this is I wanted texture on the helmet, and a lighter texture on the 'cages' for the view windows. The glass I did separetely as well because I wanted it smooth with no texture. 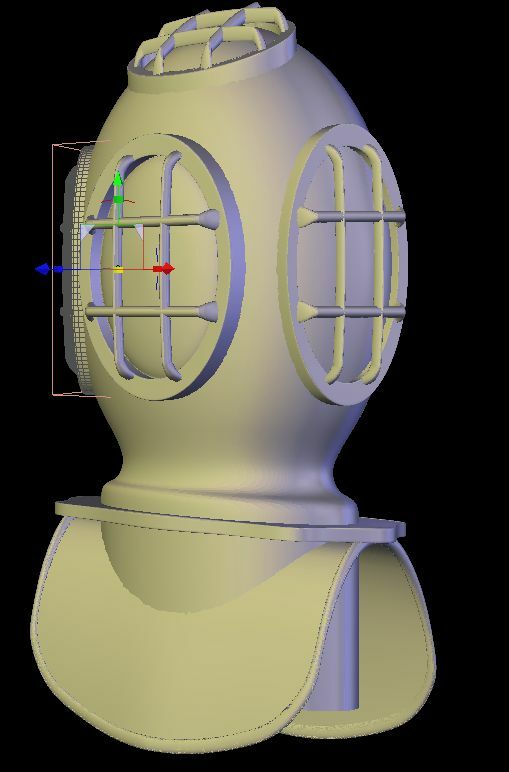 All the texture will be applied in ASPIRE, as I find this faster than texturing the original model in Hexagon. Here are the components, all separated out, ready for individual importing into Aspire. 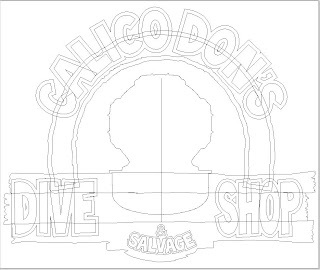 And finally, these are all the outline vectors for the rest of the sign. Before I imported the vectors, I brought in the finished helmet with all the pieces attached so I could get a usable outline for the helmet placement. This made it easy to align all the different objects. When I'm ready, I will import the helmet pieces, and use the outline for placement. 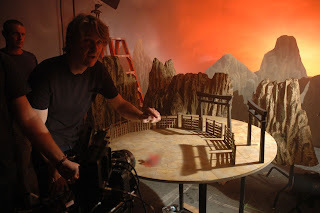 I think I will have to shelf this job for the next bit, as we have a whole whack of bicycle lane stencils to cut, as well as the Chinese courtyard and mountain miniatures for this toy commercial to start. Then I think we are on to a full size warehouse loft set for the end of the month. We will deliver the last job to set first thing in the AM tomorrow! Electronic delivery that is. The past little bit was definitely an exercise in patience! On to the physical stuff again. 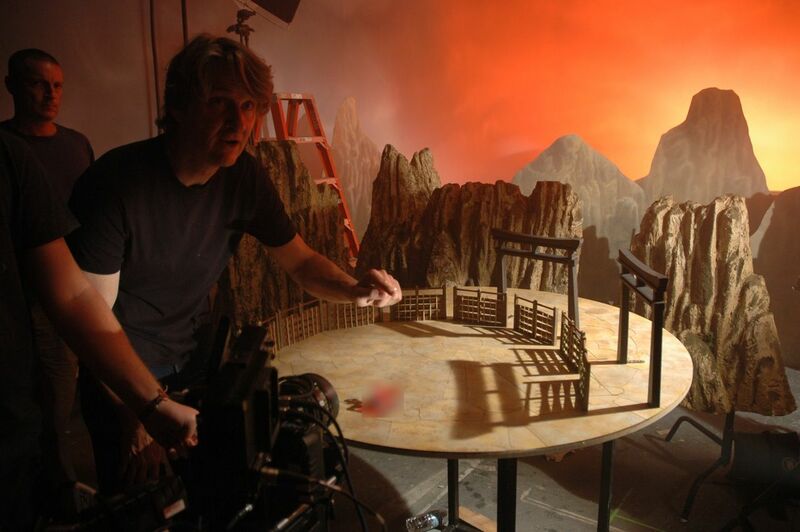 We have tendered on a toy commercial that is going to have some neat little miniature pieces to it. In fact it's all miniatures. We are waiting on camera tests from the production company, so hopefully that will be tomorrow, and then we should be able to get started. I am looking forward to getting back to the "hands on" building. I have also begun work on another side project for a sign shop we work closely with. I am going to make a generic dimensional business sign. Something that looks like it should be in a theme park. I love this kind of thing. Probably because I love cartoon stuff. The plan is to fabricate and finish it, then display it at there shop. They get a whole lot of traffic through their doors, so the exposure would be good. I would really like to start doing more of these types of signs, so I think I will! 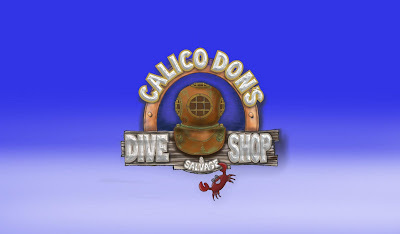 The colored render is done, then the next step will be to draw all the vectors, and model the divers mask. This is going to be fun I think.